If like me you grew up in an era where Klingons, Captain Kirk and The Starship Enterprise were part of your weekly entertainment, then it may not have escaped your attention that gaming company IGT have released a slot game based on Star Trek. It follows the full length feature film Star Trek that came out in 2009 and has actual footage from the movie in the game. My first sighting of IGT’s Star Trek slot was in Vegas in 2011, when it stood out like beacon on the crowded casino floor. The sounds and graphics alone are phenomenal. Your seat actually vibrates and there are clips taken from the movie featuring in the bonus rounds blasted into your ears from speakers in the head rest. This was a truly awesome experience, although I can't recall if I won anything. I didn't even care. I was mesmerized and I wanted more. Having tried the land-based version of Star Trek Slot, I couldn’t wait to play the online version and got my chance on a visit to Europe at the end of 2011. The online version is not quite as fulfilling as the one I played in Vegas, which is to be expected. However, compared to other IGT slots such as the widely-loved Cleopatra 2 slot and the epic Greek mythology-themed Treasures of Troy slot, it really does feel like a modern day slot game. 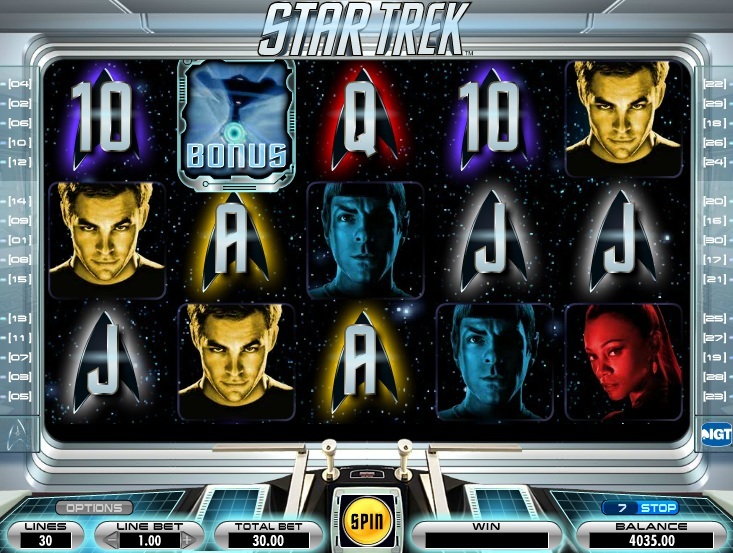 Having played for a couple of hours and doing a bit of research online I worked out that this Star Trek slot has four different bonus rounds available. To hit one you need to get the bonus symbol on reels 2, 3 and 4. The bonus symbol on reel 4 will have one of four characters from the movie; Uhura , Spock, Kirk, or Scotty. Free spins range from 3 up to 15 and up to 10x multipliers. You will have to pick from 3 choices to find out how many free spins you are rewarded. There are a couple of cool things in the bonus round, such as some extra wilds that are not in the normal play mode and re-triggers up to 250 times. So far I have managed to hit the Spock and Kirk bonus round and turned my 6 free spins into 45! 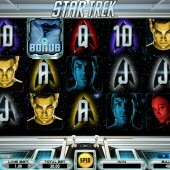 For players that have played Star Trek slots in casinos in the US, you may have come across other Star Trek slots. These are actually produced by innovative slots developer WMS Gaming, who have the license to the Star Trek TV show for their games. IGT have the license to the movie, which is why the actual actors from the film appear on the reels.